The church which ceases to be evangelistic will soon cease to be evangelical. Alexander Duff, D.D. LLD., was a Christian missionary in India; where he played a large part in the development of higher education. 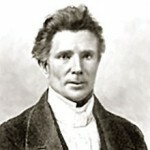 He was the first overseas missionary of the Church of Scotland to India. On 13 July 1830 he founded the General Assembly's Institution in Calcutta, now known as the Scottish Church College. He also played a part in establishing the University of Calcutta. He then accepted an offer made by the foreign mission committee of the Church of Scotland's general assembly to become their first missionary to India, and was ordained in August 1829.